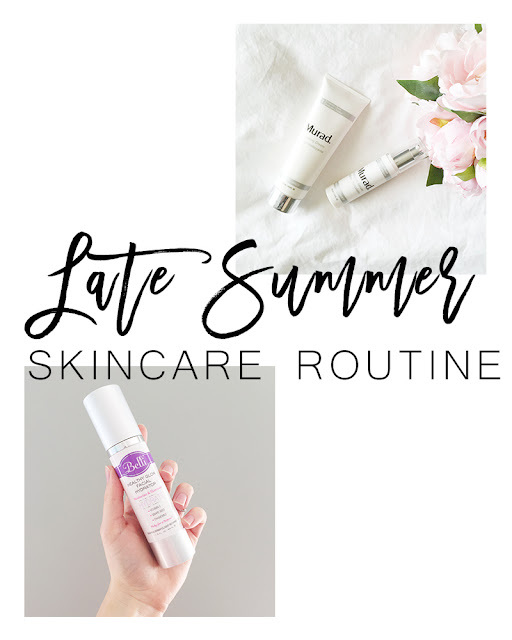 I have been using new skincare products for a few months and wanted to test them for a while before I talked about them here. It's not secret I adapt my skincare routine to the season and typically switch to lighter textures in the Summer. I have been tempted to introduce more glycolic acid based products into my routine in order to help with skin tone and fine lines. However since glycolic acid makes your skin that much more photosensitive, I decided to wait until the Fall. That's where Murad came in. Their new line White Brilliance helps evening the skin tone and brings luminosity to the skin with ingredients like porcelain flower and green tea. I have been using the cleansing cream and porcelain serum and absolutely love both. The cleansing cream is gentle yet gives a fresh, clean feeling to my skin but does not feel harsh at all. The packaging is pretty optimal and I will probably be able to use the product's very last drop. The serum is creamy and light, has a pleasant smell that does not linger on and is easy to apply. It is not greasy and does not break me out. However it does not moisturize at all, so following with a good moisturizer is essential. After a few months, I am not able to see a difference on hyper pigmentation, however my skin does look more luminous. I then use a completely natural moisturizer I was very skeptical about at first: the Belli Healthy Glow Facial Skin Hydrator is a lightweight moisturizer, free of harsh chemicals and perfect for every day. It moisturizes but does not clog pores or make me shiny. Some natural moisturizers tend to smell odd or ball up when applied to the skin. This one has a smooth texture and the smell is natural but light and not unpleasant. Do you like natural or organic skincare?